1. What is Pilates? Pilates is a fitness system, taking from Martial Arts, Gymnastics, Yoga, and Ancient Greek training techniques. Its focus is on the coordination of the mind, body and spirit. Joseph Pilates spent his life studying the human body, its design and its movement patterns. He has left us a rich legacy of insights, and a series of detailed instructions on how to improve our bodies through his precise series of exercises. Trying to describe Pilates in words is as difficult as describing a beautiful piece of music. You have to experience it in your own body. 2. What will Pilates do for me? Pilates will strengthen every muscle in your body without strain on your joints. You will be taught precision in your performance by concentrating on every part of your body as you execute each movement. As you engage the mind on the fundamental level of body awareness you will improve your alignment which will lead to great posture and balance. These three basic concepts form the essential foundation of your Pilates practice. Don't look for a quick fix with this conditioning system, but expect to walk away with a new awareness of your body after a well taught first session. After just a few properly conducted sessions you will feel more balanced and stronger, you will breath better and have more stamina. You will re-educate your muscles to find balance in your body and develop core stability that will help you carry yourself with ease and grace. Actors use this method, their bodies are their tools of the trade. 3. Who was Joseph Pilates? This fun video gives a brief history of Joseph Pilates. It was made by Taube Pilates Training in Australlia: 4. What is the mind-body connection they talk about in Pilates? Your body is one of the most complicated designs imaginable. To move the bones that hold up our bodies we have evolved muscles. The instructions for these movements originate in our brains and our nerves carry the instructions to our muscles. Joseph Pilates has developed a method that allows us to train our brains to use our muscles correctly and efficiently. One of Joe's great insights was that the best way to accomplish this is through movement. During the practice of Pilates we constantly reinforce this correct movement pattern until it becomes hard-wired into our brain. And like a skilled athlete you will begin to use your body in a relaxed and coordinated manner. 5. Is Pilates for Men? Yes, Pilates is for men. 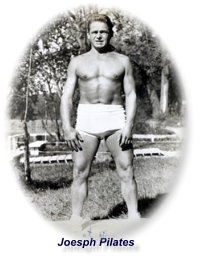 Joseph Pilates was a serious athlete and worked these exercises out for himself. He developed them to strengthen his body, to make it more flexible and to give him more control over it. He originally called his method Contrology. Men will run faster, cycle stronger, play golf with less pain and enhance their tennis. Many professionals in these fields -- as well as football and hockey players -- use Pilates to improve their conditioning. Many call it their secret weapon. More men are discovering the benefits of Pilates. Look at the testimonials of some of our male clients. 6. How is Pilates different from a workout at the gym? Pilates focuses on the quality and precision of your movements. Because it involves your mind you need to concentrate and never do more than ten repetitions. With more repetitions your mind goes on 'automatic' and tunes out. This will adversely affect your instructions from your brain to your muscles. You will loose the concentration that requires you to engage all of your body all of the time. 7. How often do I need to take Pilates to get a strong core and long, lean muscles? Three or four times a week would give you the best results in the shortest time. But most of our clients can come only once or twice a week and they make good progress. Each session will add to your knowledge of how your body works; you will benefit from any amount of Pilates. Chances are that once you start seeing and feeling the changes in your body, you will come as often as you can. 8. Can I do Pilates if I have sciatica? Yes, the acute stage of sciatica -- the first two or three days -- requires rest to calm down the affected nerves. After that, gentle exercises can be introduced to strengthen the muscles in your back that protect your spine and hold the disks in place. Strengthening your abdominal muscles will help support the vulnerable lumbar region and the SI joint. Gentle, balanced movement helps correct uneven usage of your hips and alleviates the stress this puts on the sciatic nerve. Be patient, this can take a little while to correct. 9. Can I learn Pilates from a book? Can you learn to dance from a book, or sing, play the violin or fly an airplane? There are many good books out on all these subjects, but if you want to master any of them, including Pilates, find a well trained instructor. This wonderful system of body conditioning is complex and requires some effort, but it will be well worth the investment in time and money. 10. For how long should one do Pilates? Pilates is for the rest of your life. It helps prevent injuries, improves your balance, makes you more flexible and encourages proper breathing. It focuses on your core postural muscles that help support your spine and, as Joe says: "you are as young as your spine is flexible." And there is another bonus -- Pilates exercises are fun! 11. Where can I learn more? 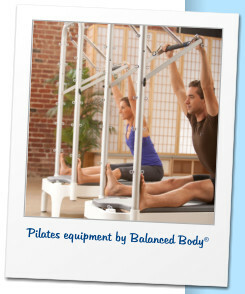 Try Balanced Body’s website for more excellent information about Pilates and its inventor, Joe.